The Mikael Playhouse began as the Mikael Playgarden–an initiative started by Bella and Jake Tan, plus a handful of us who had a vision of providing a good environment for kids of working parents. The Mikael Playgarden has since changed hands, hence the new name. I do not know the new owners but the teachers are the same (all trained by Bella Tan), so I can say that it is still a Steiner daycare. The article written below was written for the original Mikael Playgarden, so I am keeping it whole. The very first Steiner-inspired daycare is opening in Makati this July. The Mikael Playgarden is located at Palma St., behind Rockwell. 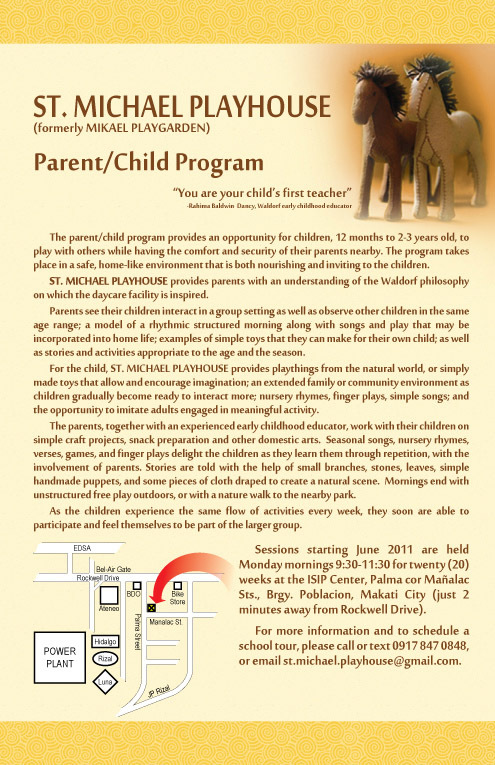 It will look after children ages 2 to 5, Mondays through Fridays from 8:30am to 4:30pm. The Mikael Playgarden aims to address the needs of parents who are working and would like their children to be in a healthy, nurturing environment during their absence. It is also ideal for mothers who have more than one very young child and could use the help caring for one more, or any parent of a young child who would like to give their children a sound, safe, holistic home away from home. Like the Steiner kindergarten, the day at the Mikael Playgarden is structured. It opens with a few minutes of free play as the children settle into the morning, after which a healthy, organic snack is served. Then they go for outdoor play and later settle back in for storytelling, which is usually done with dolls and puppets. An organic or biodynamic lunch is served and then the children settle for a nap or long rest. Then they draw, paint or do other crafts and play indoors. Another healthy snack is served before the children play outside or take a walk around the area. Then mommy and daddy come to bundle them home. This is the daily rhythm. It is a good way to spend the day as it creates a balance and flow that is not dull but also not over-stimulating for the child. I try my best to keep to a steady rhythm at home, too. That way, my children know what to expect, whether I am home or not. They know that after breakfast it’s playtime outside, then we come in and get together for a story or drawing or indoor play then it’s lunchtime, then it’s rest time, whether they nap or not…on and on and on. And it’s the same daily. It keeps my children secure and is a good foundation for discipline. Why will they argue if bath time is the same everyday? (Ok, they still try but since they know that’s the way things are, they’ll bathe anyway). I’ve heard some parents say they avoid rhythm because they’re afraid it will bore the children, but subtle cosmic rhythms are the basis of our existence: the sun rising and setting, the phases of the moon, the changing of the seasons, the beating of our heart, our breathing. Our children thrive when we honor their need for clear boundaries, especially in the early years. They need to know what is coming next. This makes them feel safe. When the child doesn’t know what to expect from one moment to the next, he lives in uncertainty and wears out his energy to achieve balance amidst the chaos, and then we wonder why they are cranky or out-of-sorts. By getting our children into a rhythm, we support the healthy development of their organs and emotional life. There are times we can’t stick to the rhythm of the day because life does that, but I always see how it affects the children. If I let them play continuously without a quiet rest in the afternoon, by 5pm they are grumpy and difficult. My remedy is to get back on schedule as quickly as possible. This is quite helpful when we travel as the rhythm acts as a sheath from home that gives the children an inner compass that says: no matter what strange new world we enter, the ebb and flow of our daily life remains the same. In this way, they feel held by the invisible arms of a strong rhythm. It is a powerful tool that gives our children a most important gift: security. 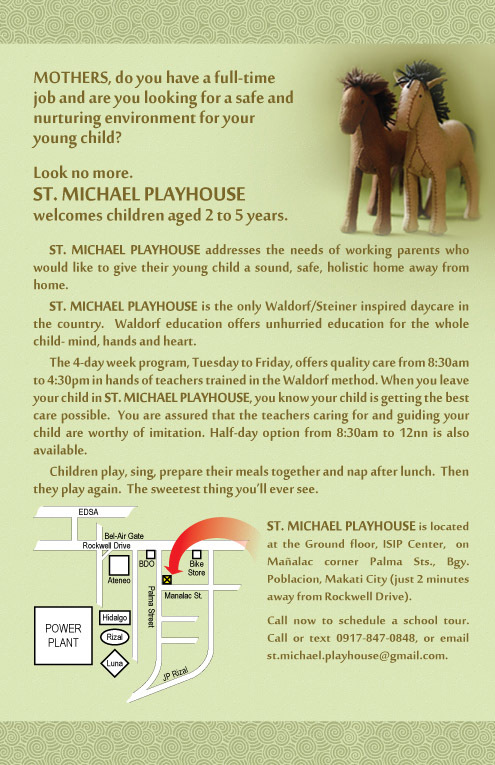 The Mikael Playgarden holds rhythm as a value. It is not a daycare center where a mother can drop off her child on a whim or pick him up in the middle of the morning because lola misses him. If the parents don’t enroll their children for the full 5-day program, they are encouraged to choose specific days of the week and stick to them. That way, the children know that after a day with mom at home comes a day with his friends at the Mikael Playgarden, and the children who are in the center also know that on set days they see Jake and on others they see Adriana. The duration and frequency of their stay at the daycare are important in establishing a healthy and well-founded rhythm. It is through repeated and steady experience that the children will reap the benefits of the daycare, at least for the first three to six months. The Mikael Playgarden is also a haven away from electronic media and junk food. (Now there’s a recipe for calm!) This is a place in the city where you know your children are not being bombarded by images and sounds that are inappropriate for their still developing organs which thrive and grow in peaceful environments. The food is healthy; organic or biodynamic whenever possible, to ensure that the children develop sound eating habits that will support their health for a lifetime. If I were a working mom who agonizes over leaving the kids with the yaya or grandparents and in-laws who don’t respect the way I raise my child, I would grab at the chance to give him something better. I would also make sure that my caregivers and others involved in the life of my child attend the lectures and workshops on parenting and yaya training that the program provides to help supplement and support the child’s learning experience at home. This is a great opportunity for parents who need to work but also want their children to be raised consciously and in a healthy and peaceful setting, even if they can’t be there all the time to do it. The future of our country depends on children who grow up to be healthy in thinking, feeling and willing. The environment they grow up in, especially in the early years, matters.